U.S. Customs Forms | Pacific Customs Brokers Inc. 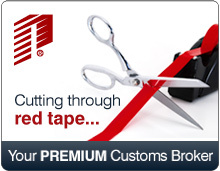 Please feel free to contact Pacific Customs Brokers Client Services Team at 604.538.1566 if you require assistance. The U.S. Customs Invoice. It requires the shipper's name, consignee's name, IRS#, description of the goods, value of the goods, and the country of manufacture. Please indicate the U.S. Customs Port of Entry. Calculated by manifested quantity. 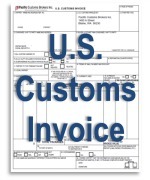 The U.S. Customs Invoice. It requires the shipper's name, consignee's name, IRS#, description of the goods, value of the goods, and the country of manufacture. Please indicate the U.S. Customs Port of Entry. Calculated by unit quantity. Information on requirements for providing proof of country of manufacture. Declaration of Motor Vehicles and Motor Vehicle Equipment Subject to Federal Motor Vehicle Safety, Bumper and Theft Prevention Standards. This form is used to register goods before they leave the U.S., if intended on returning the goods after use in the foreign country. This form is used for textile products made of fabric/yarns from one country. This form is used for textile products made of fabric/yarns from more than one country. This form is used for the export of articles previously entered into the U.S.A. temporarily and without the payment of duty. This form is required for any product that emits radiation. This form is required for any product that contains toxic chemicals controlled under the Toxic Substance Control Act. This form is to request a Temporary Import Bond (TIB) for items imported into the U.S. on a temporary basis. This form is required for electronic goods being imported into the United States. If a product conforms to FCC, it will have a FCC number on the back of the product. United States Environmental Protection Agency Declaration Form Importation of Motor Vehicles and Motor Vehicle Engines Subject to Federal Air Pollution Regulations. This form is required when importing any of the following: Any wild member of the plant kingdom, including roots, seeds, parts, or products thereof, and including trees from either natural or planted forest stands. Some exceptions apply. See form for details. This form is required when importing peppers into the United States. Note: Adobe Acrobat Reader is required to use these forms. U.S. Customs requires that certain information be provided; this form is used to provide that information to customs for all U.S.-bound commercial goods. The form may be prepared and/or provided by the supplier or importer of record. 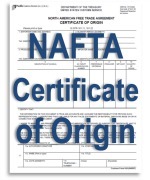 Strictly for eligible goods from Canada, and/or Mexico and valued over $2,500 USD, this Certificate of Origin is used to request a lower duty rate for eligible commercial goods entering the U.S. under the North American Free Trade Agreement. If eligible, it's important to note, this program is not mandatory for your importations; and assistance is highly recommended. Also, U.S. Goods Returning (USGR) require separate documentation to make the duty free claim. 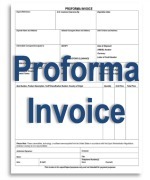 A proforma invoice may be used when the commercial invoice or U.S. Customs Invoice is not available; for instance in the case of a commercial shipment when no monetary transaction has taken place between the importer and exporter.